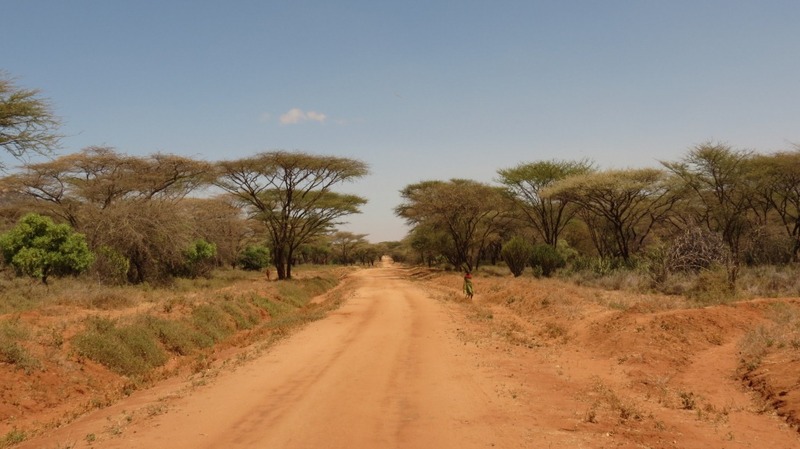 In choosing your route north from Nairobi to Ethiopia you have two options. 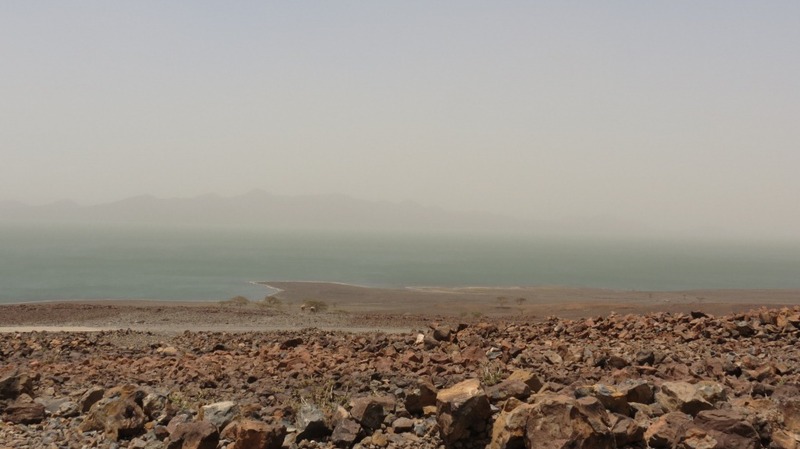 On one hand, there is a vague route via Lake Turkana, taking you over the road ‘hardly ever trodden,’ and travelling close to 1000km without fuel stops nor another vehicle in sight. 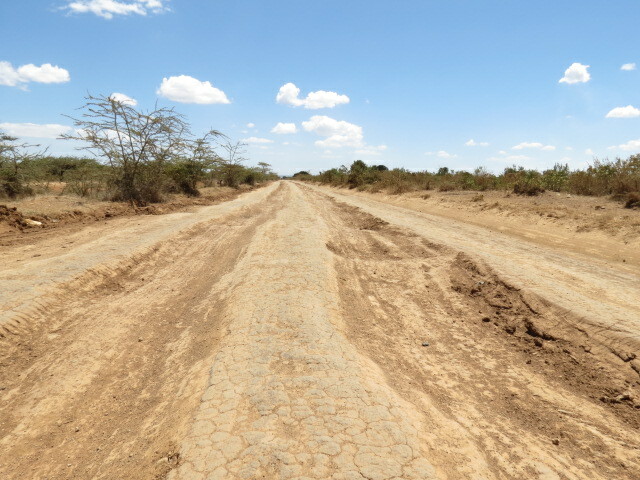 On the other, the infamous Marsabit-Moyale ‘road’ is claimed by many as literally the worst in Africa. 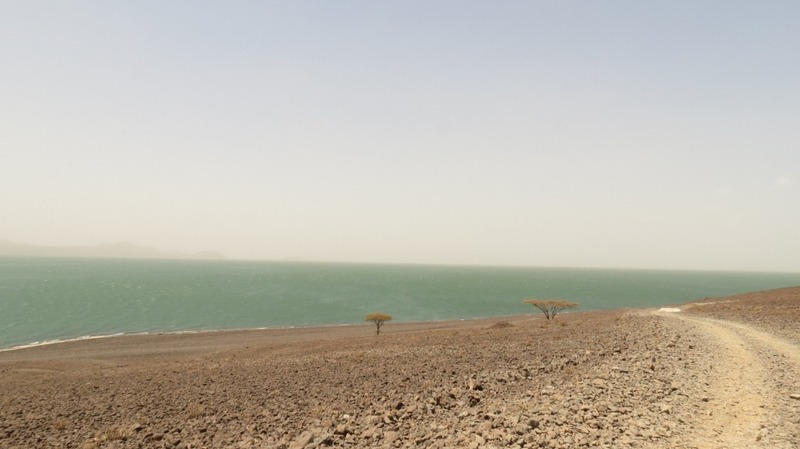 With Kenya’s elections drawing nearer, we chose the Lake Turkana route, figuring our quest for isolation would keep us well and truly away from any potential political flare ups. 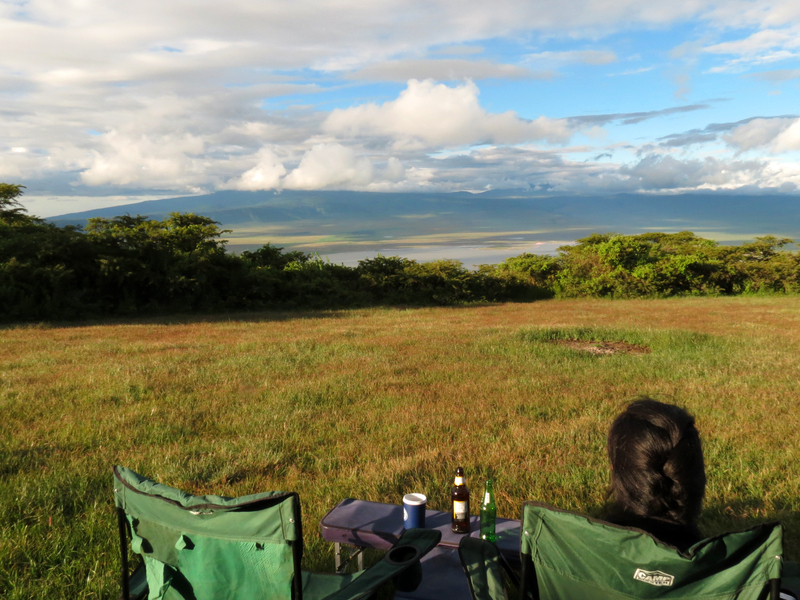 Lake Naivasha, our first stop ~150km out of Nairobi, is one of Kenya’s four great Rift Valley lakes. Our campsite, Carnelly’s (spelt wrong in the guide books and possible here as well) is stunning, sitting amongst swampland that extends all the way out to the lake. 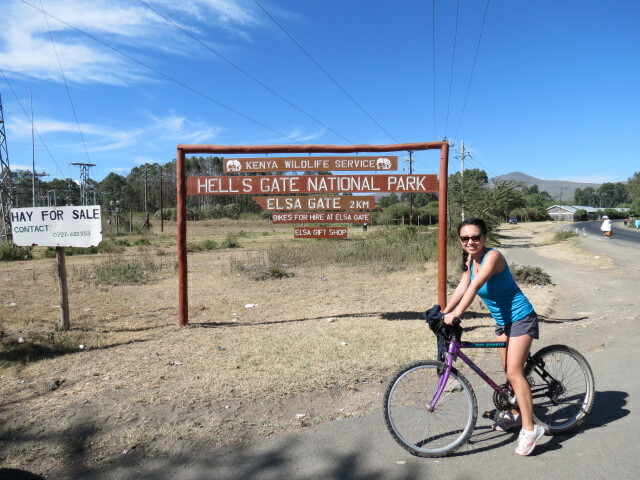 We stayed a couple of nights in order to visit Hells Gate National Park – unique in that it allows people to ride bicycles right amongst the African game. 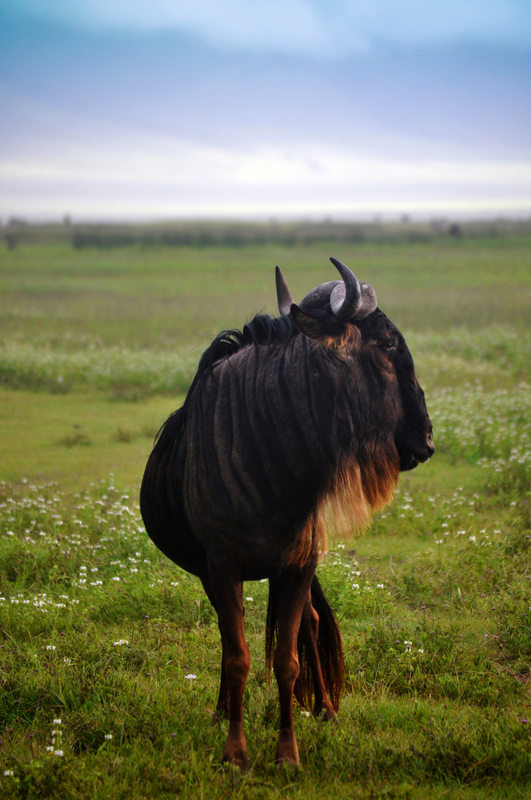 Like many parts of wild Africa, development is taking its toll. About 3/4s of the way to the end of the Hells Gate trail, out of nowhere huge construction vehicles begin appearing, tearing their way through the park’s dirt tracks. A pleasant place for a bike ride it is not. 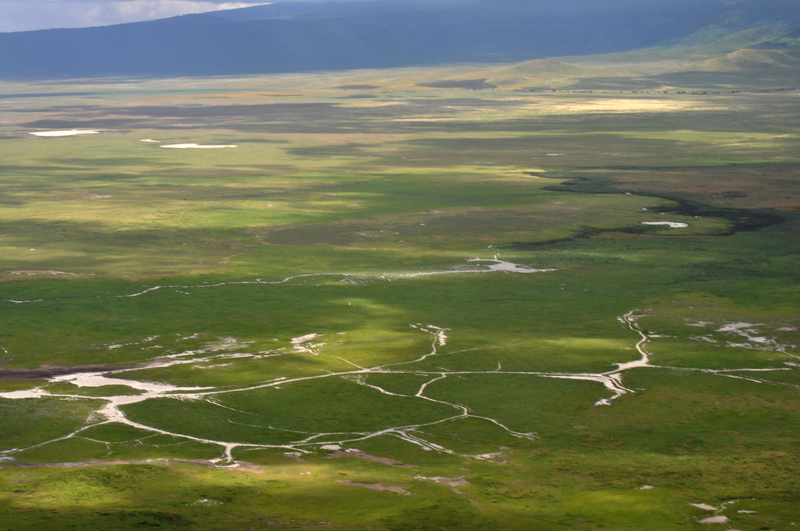 Whilst the geo-thermal plant under construction will undoubtedly improve the local economic situation, it is a shame it is to the detriment of this wonderful national park. Thankfully we managed to avoid this as we packed and repacked the car with the extra fuel and headed out of town. 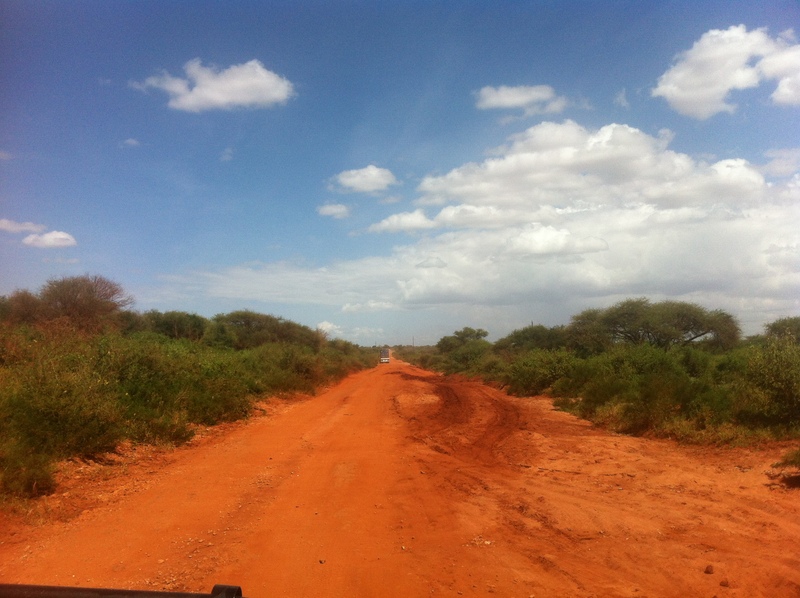 Driving through this part of Kenya up towards Maralal was unlike any part of Africa we had yet been. We were riveted by the wealth of the land as we journeyed through the green undulating hills formed by tectonic plates attempting to rip Africa in two. 200kms into the picturesque journey, the tarmac suddenly dead ends into dirt. After deflating our tyres and our 3rd hour vanished, we gave into our realization that we had seen the last tarmac until well into Ethiopia. The final 120km of bumping around the rough stuff took us close to 5 hrs and we arrived at Yare Camel Club in Maralal in the early evening. The long, slow driving we had better get used to. A political party had gathered at the camel club’s ‘function room’ and we recalled our daily security alerts reminding us to ‘avoid all political gatherings’. We bunkered down and hoped for the best. We managed to find fuel in Maralal and greedily topped up our tank on the way out of town. 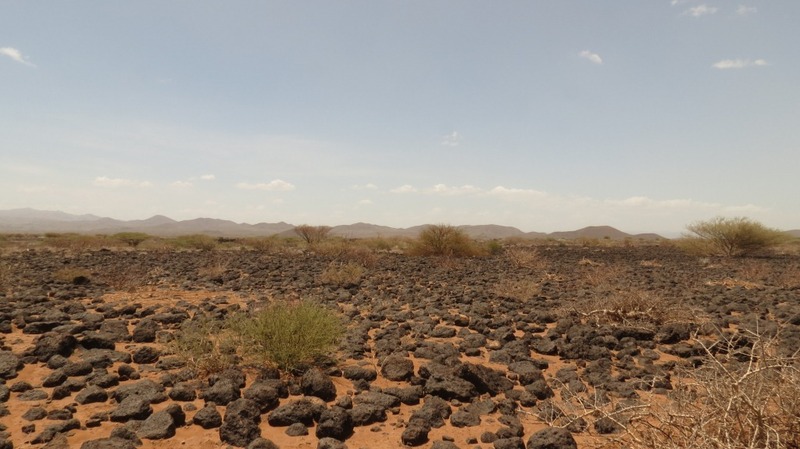 The GPS had two options heading to South Horr through Baragoi: one via ‘very bad rocks’ and another more obscure route through Barsaloi. Hoping to preserve our tyres, we opted for the latter. Leaving the main C77 road behind us, the obscure route dead ended a few times in Maralal before we found the right track. 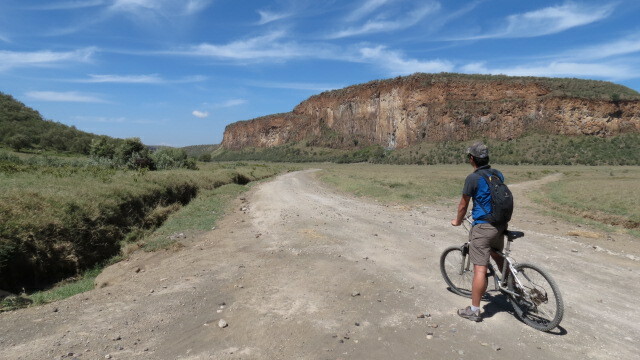 The road disappeared at times, with only sandy tracks to follow as we wound our way up through the Rift Valley ranges. The road less travelled was for the most part in great condition. After quite nearly rattling our teeth out the previous day, it was a welcome change. Only when the real climbing started did we realize why maybe ordinary traffic might typically opt for the main route. Some of the day’s better roads! Road building typically dictates that steep ascents and descents are negotiated with winding, hairpin tracks. This particular service road simply dove straight in on a degrading marble surface. Now crawling through the mountains in low range 2nd at 15-20km/hr, concern quickly grew that the ‘short’ 150km day was turning into another epic. Just like that however, we were through the mountains, and the wonderful Rift Valley opened up stunningly in front of us. 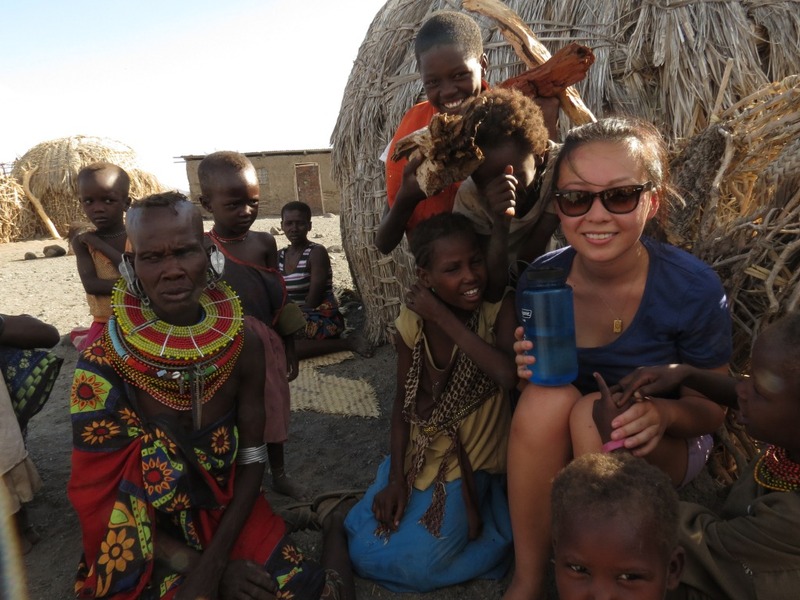 Returning to the flat sandy tracks, we managed to make it to South Horr, a dry riverbed village by mid-afternoon. We camped out at the Samburu sports club, and low and behold, a political gathering amassed for the 2nd night in a row. 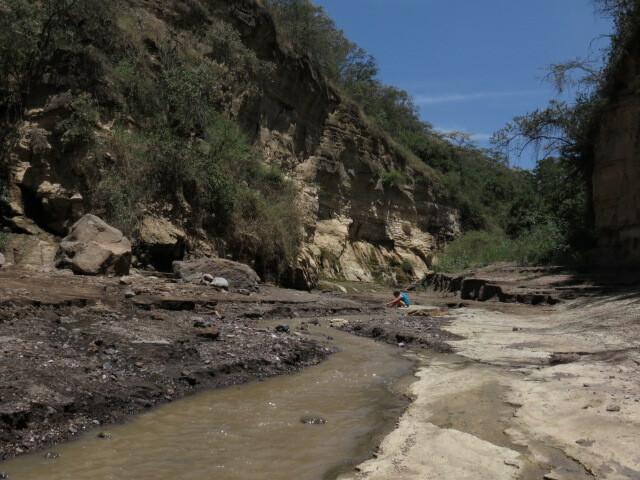 With only 90km to our first stop on the lake at Loyangalani, we left the dry riverbeds mid-morning. 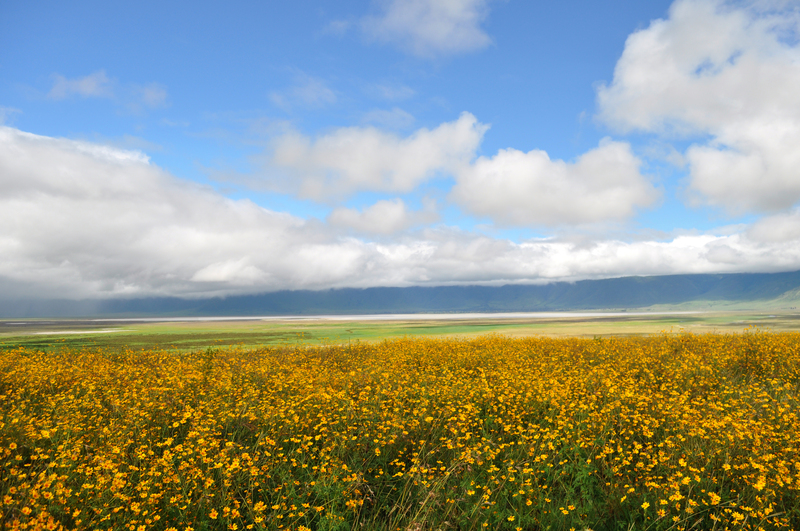 As we continued, the landscape changed completely once again, and we found ourselves bumping along amongst the volcanic plains. 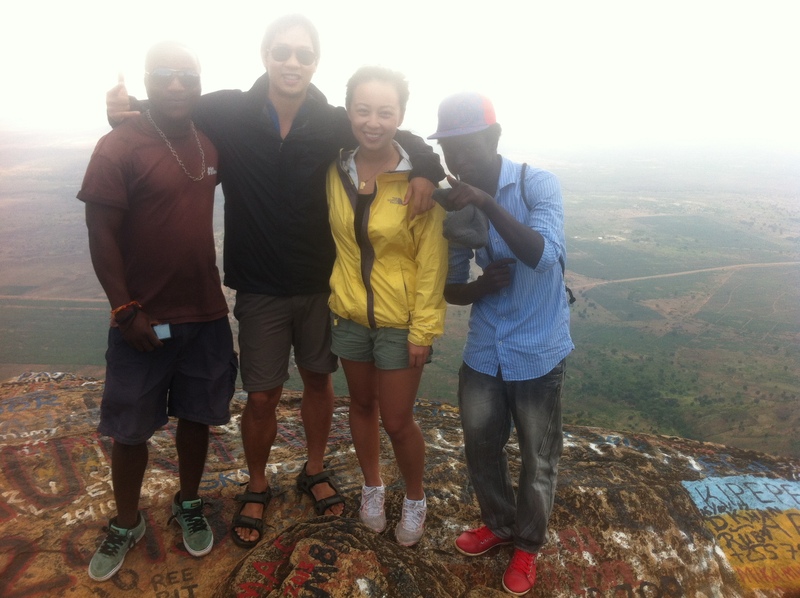 Hot and windy, the uncompromising landscape of volcanic boulders was out of this world. Our first glimpse of Lake Turakana (i.e. the Jade Sea) was a jaw dropping experience. 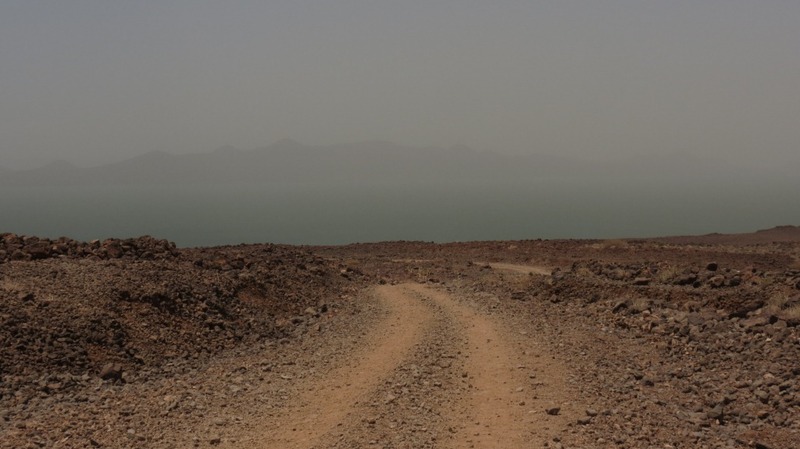 Out of a seeming nothingness, in a hot, windy desert, a stunning body of water began to appear in front of us. With a coastline larger than that of Kenya’s entire east coast, the Lake’s green waters were incomprehensible. 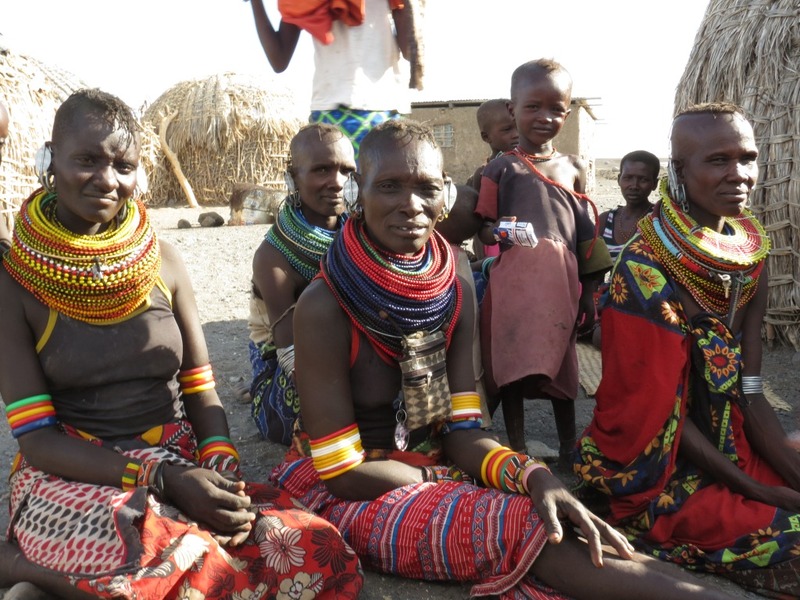 As we pointed the PPE into the oasis town of Loyangalani, we began to encounter some of the most colourful tribal people we had yet met. 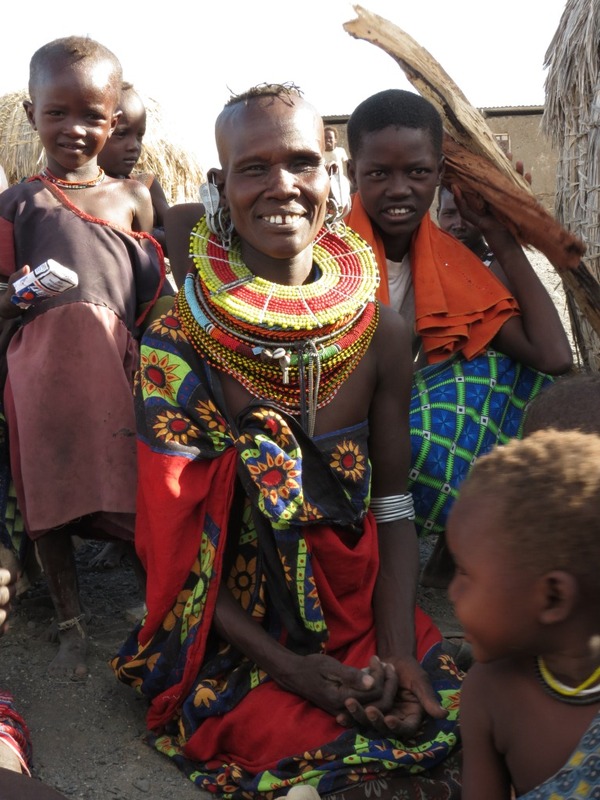 Adorned with beads and jewelry symbolizing their hierarchical status, people from four different tribal communities in Loyangalani coexisted peacefully. 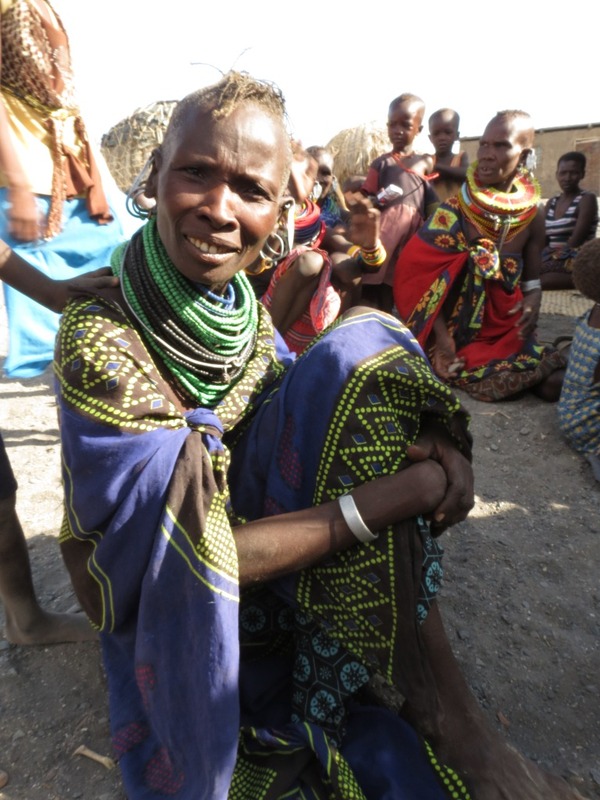 The tough desert like conditions had however taken their toll; two years earlier a devastating drought had obliterated the majority of their livestock, leaving the communities to survive on food aid. After a hot windy night in the tent, described by our friends Linda and Jurgen as ‘having hair dryers blowing on you all night’ we were up early and ready to push on. This next leg of the journey would be the most remote of the entire trip, and we stocked up well on oasis spring water before leaving. 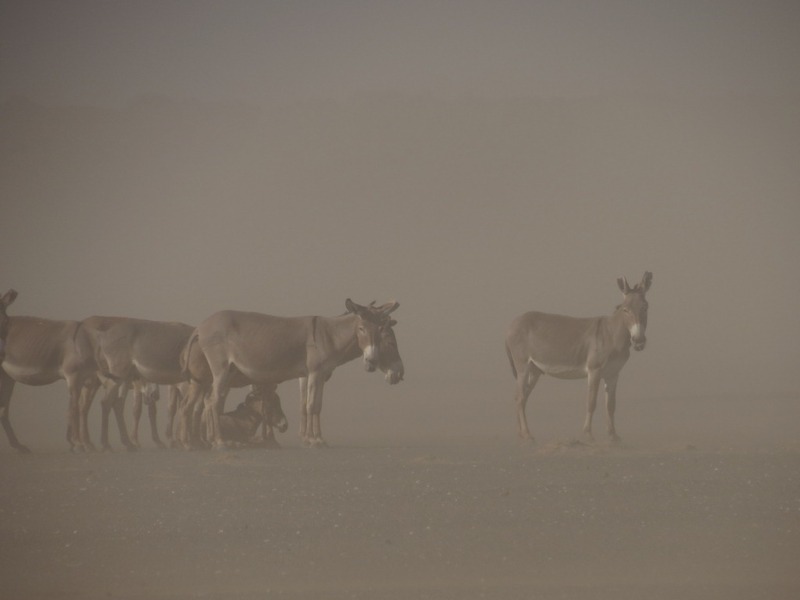 The windy landscape that we encountered was the most devastating we had been through yet. 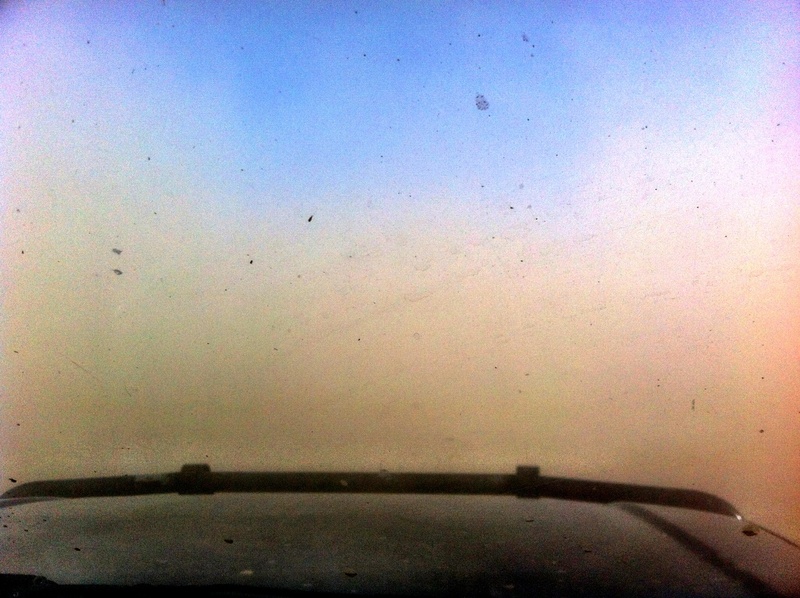 At times we were forced to stop the car completely as the PPE was engulfed in dust storm after dust storm. Often we would emerge unsure whether we would still be able to find our tracks. 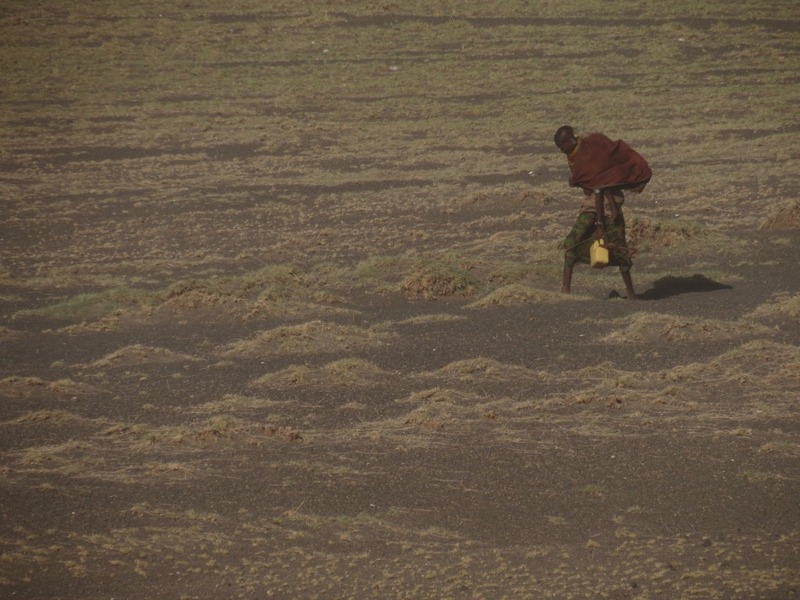 Despite all this, in the most dumbfounding of environments, we continued to encounter the nomadic tribal people battling the elements on their endless journeys for survival. 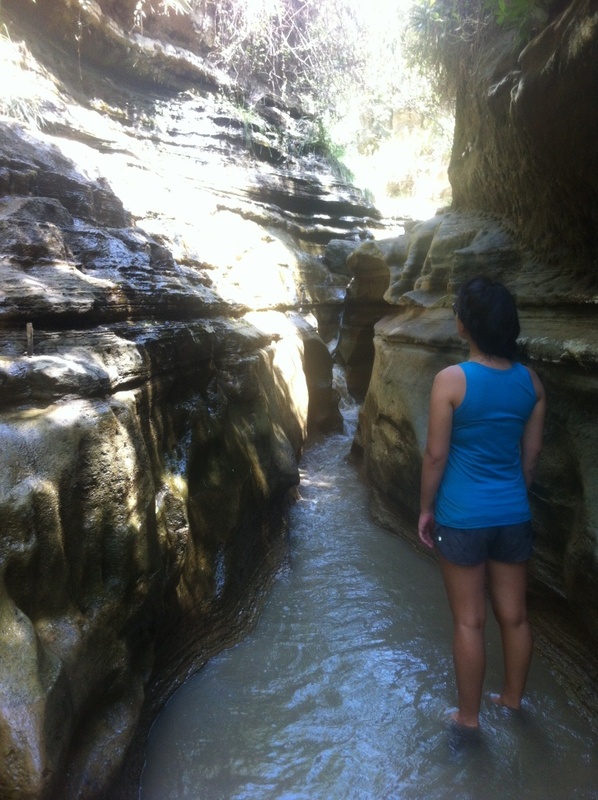 As the PPE continued over the rocks we eventually found the entrance to Sibiloi national park. 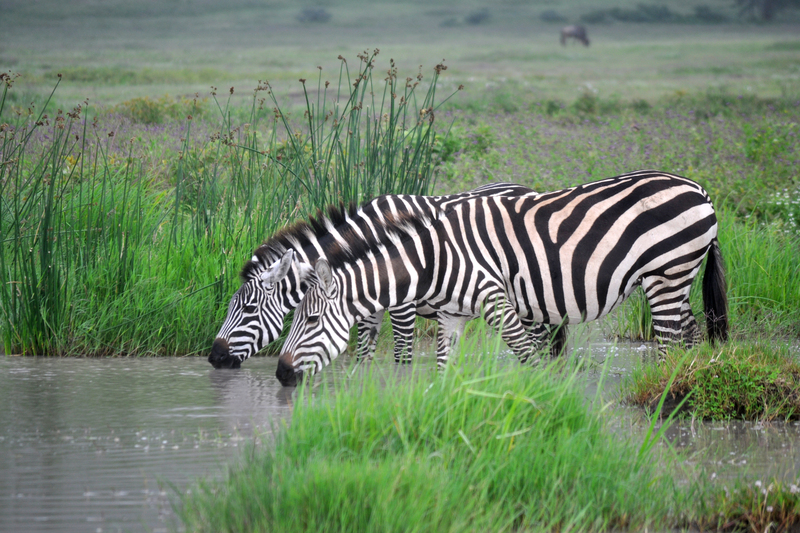 Having a Tanzanian driving license we entered at the resident rate, a hefty 90% discount off tourist rack rates. Although we had hoped to push all the way through to Illeret, we opted to pull off the road and bush camp in the national park. It was our most inspiring decision yet. Wanting to beat the heat and any potential onlookers, we were up at the crack of dawn ready to cross finally into Ethiopia. We stopped by the local police station at Illeret for updated information, and to register our intent to cross into Ethiopia. Charles, the local police officer was much obliging and we topped up our fuel tank with 50L from our reserves and pushed on. 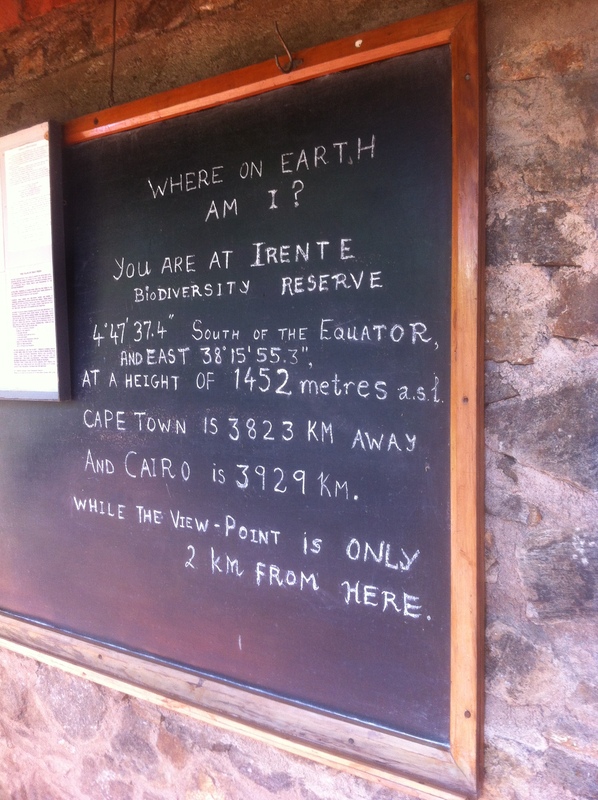 Crossing borders at this obscure corner of the continent was a non-affair. 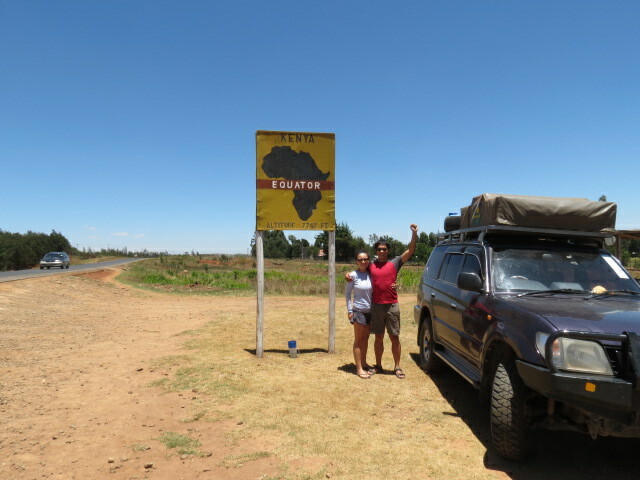 Suddenly we were driving in Kenya; and the next, we were crossing a line marked only on the GPS and we were in Ethiopia. We had made it! 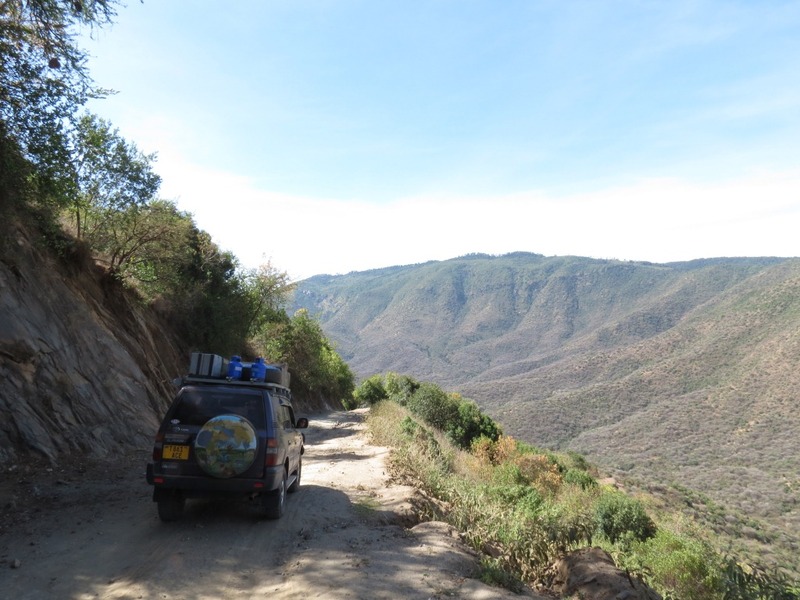 We eventually hit a real (albeit gravel) road, our first in over 750km, and turned left to report at Ethiopian immigration control in Omorate. With our passports in order after the arduous process of visa applications in Nairobi, we expected to pass through with a breeze. Not so. A customs officer was adamant that a carnet de passage was required to cross (it is not) and was unwilling to allow our vehicle into the country. He jokingly (but not really jokingly) told us we would have to turn back. So we waited. And argued. And eventually, on presenting more useless pieces of paper, he discovered one stating ‘FOR OFFICIAL USE ONLY’. Satisfied, he collected it for his folder and agreed to let us pass. 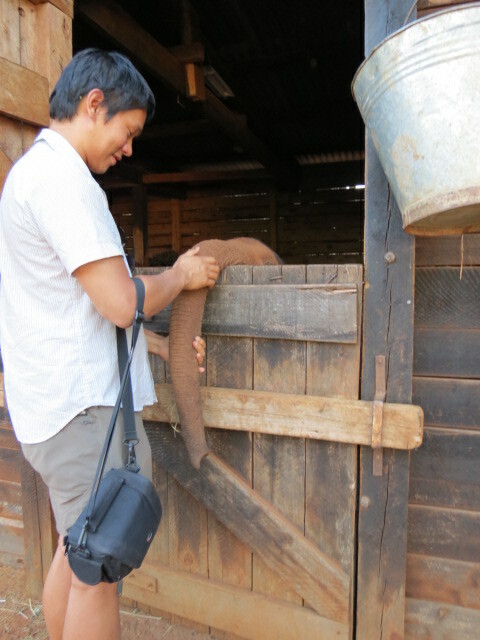 The slip of paper was a receipt for payment for visas into Kenya, but we quickly gathered our things and headed off. 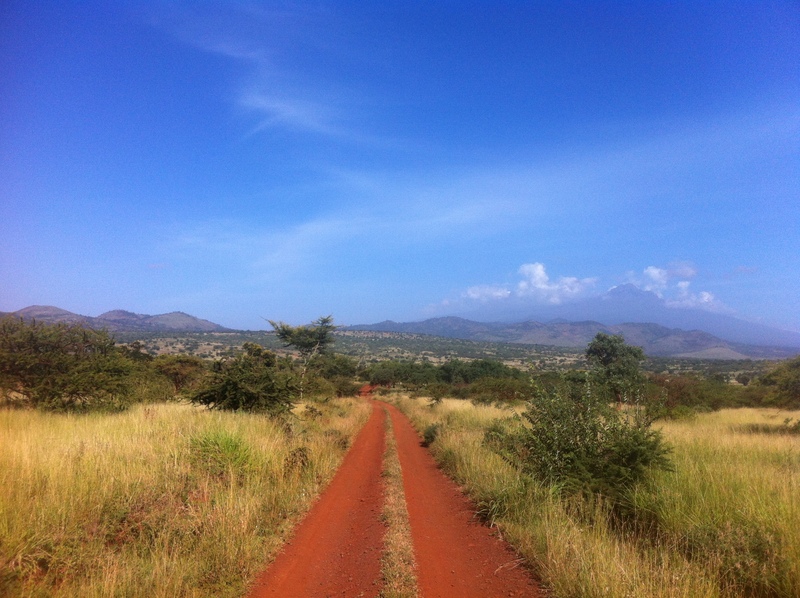 We neared our intended campsite in Turmi in the early afternoon, but with the promise of internet, a beautiful campsite, ATMs and hot water showers in Konso, we decided to push the 200km further on. 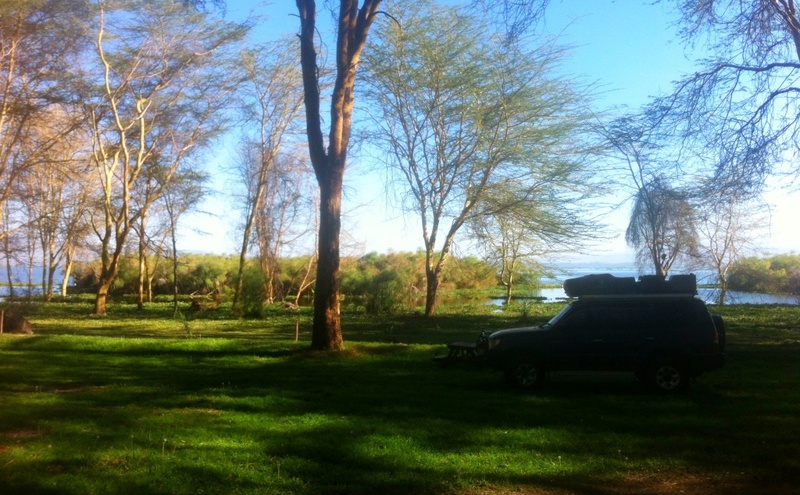 A serendipitous call: despite lacking the promised riches, our ‘camp site’ ended with a delightful reunion with our friends Linda and Jurgen from Nairobi. Bumper to bumper traffic welcomed us into the Nairobi, East Africa’s hub. And we were quintessential country kids who finally arrived at “the big city,” marveling at the 24-hr stores, cosmopolitan fare, and skyscrapers 10 stories high. 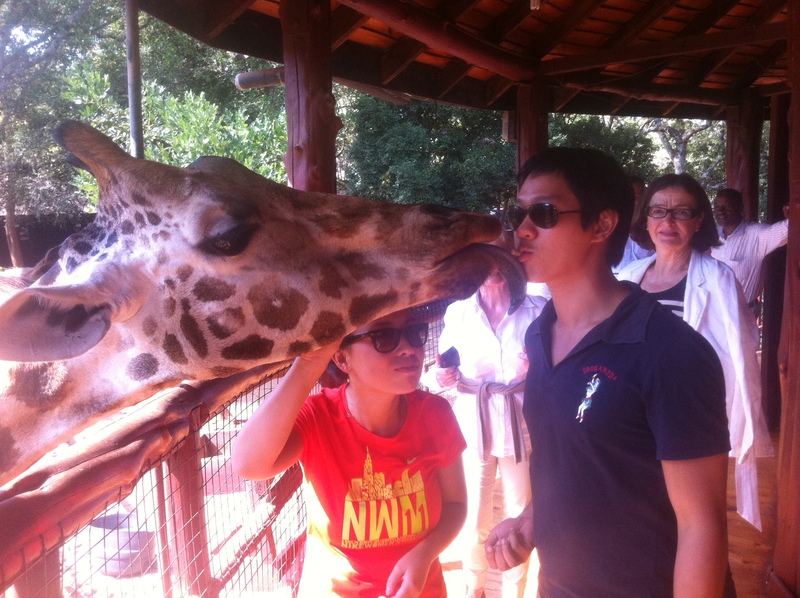 One of our first days here, we delved into Nairobi’s wild side and paid a visit Nairobi’s Giraffe Center, a success story amongst conservationists. 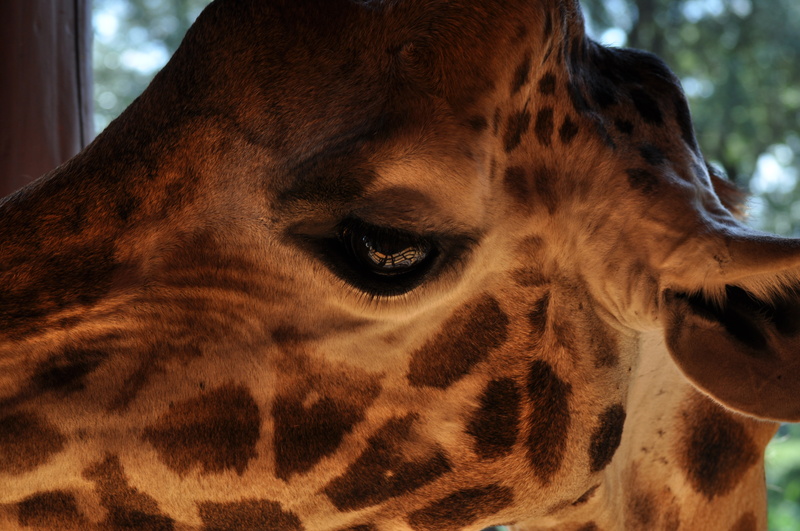 The efforts of African Fund for Endangered Wildlife (AFEW) has more than doubled the population of Rothschild’s giraffes, and the center has successfully released these beautiful animals across Kenya’s national parks. 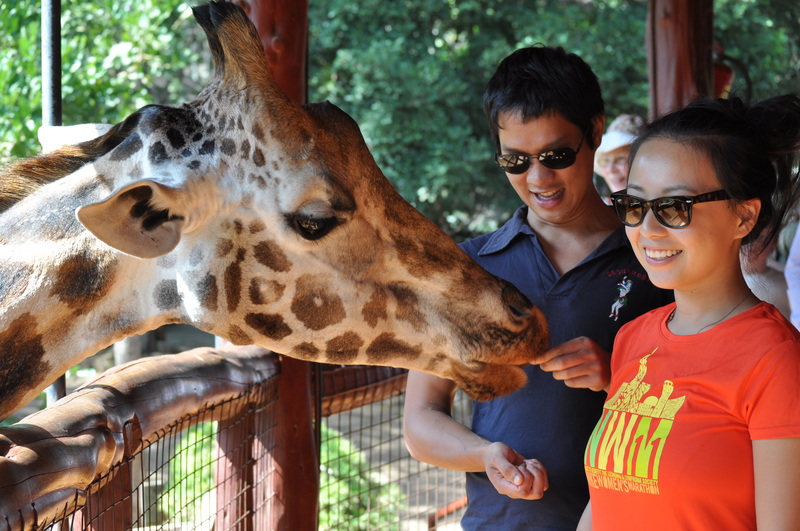 Hands full of food pellets, we stood face-to-face with the giraffes on a perch and fed them their afternoon snack. With tongues rough as sandpaper, big shiny eyes, and an unimaginable amount of slobber, the gentle creatures won our hearts. As evidenced below! Getting a Valentine’s Day kiss from Lena! 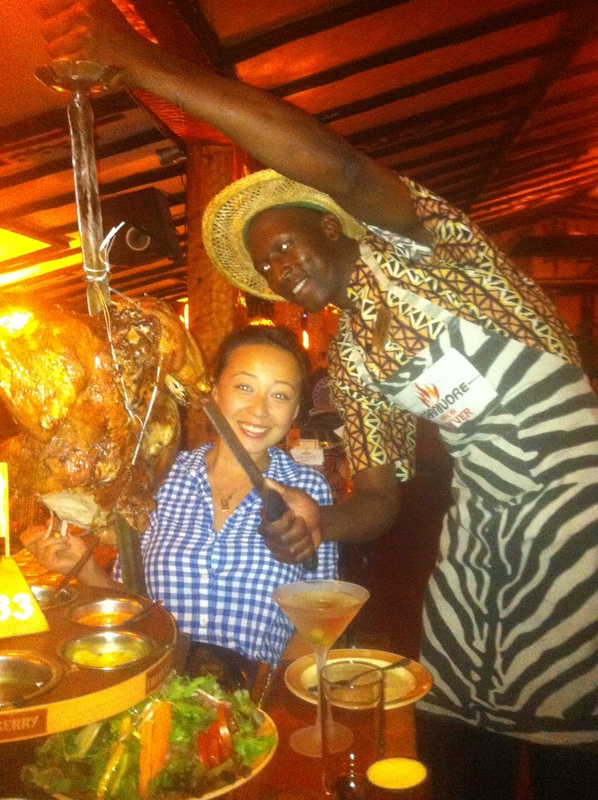 Two nights later, we checked Carnivore off our Nairobi bucket list. This restaurant takes nyama choma (the unofficial dish of Kenya, meaning barbecued meat) to new heights. With unlimited soup, salad, and 20+ meats brought to the table on swords, the food doesn’t stop coming until the white flag waves, literally. (There’s a flag on the table you need to knock down). Needless to say, we left satisfied. 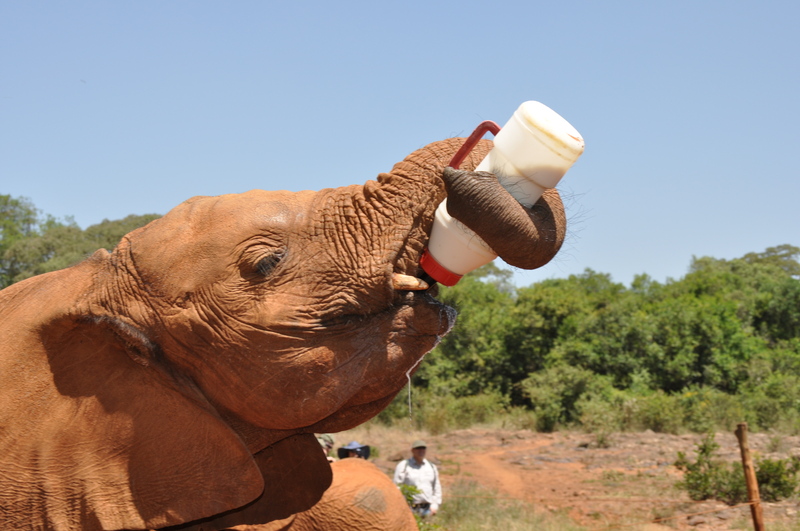 The following day we visited the David Sheldrick Center, a foundation that takes in orphaned baby elephants and rhinos, rehabilitates them, and releases them back into Kenya’s wild parks. 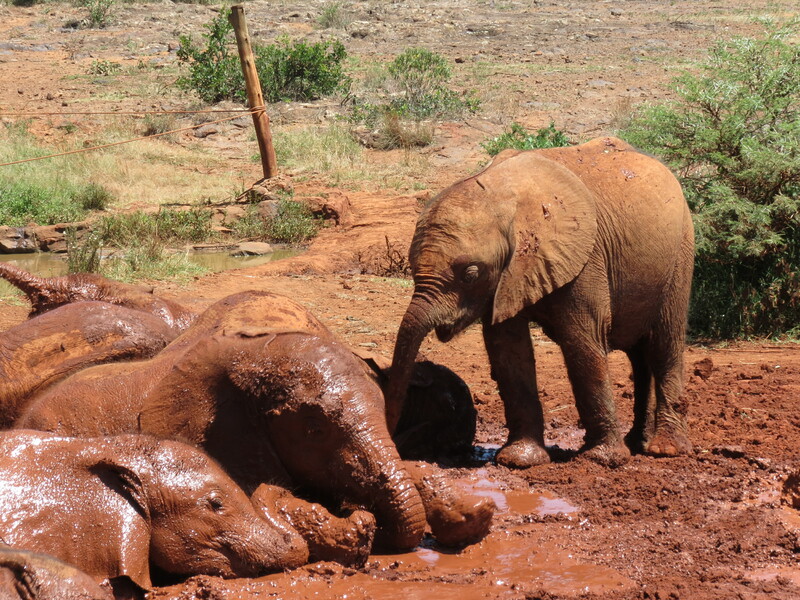 For one hour every day, they allow visitors to come and watch the baby elephants get their daily mud bath and lunch time milk bottles. 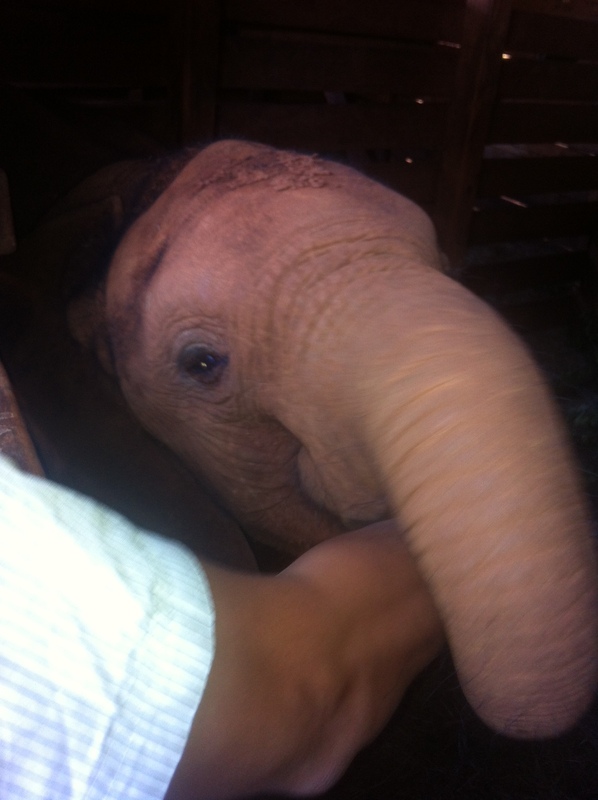 We were smitten, and promptly adopted one of them–a baby girl named Sonje. As new foster parents, we received an invite to return in a few hours and see her bedtime ritual. 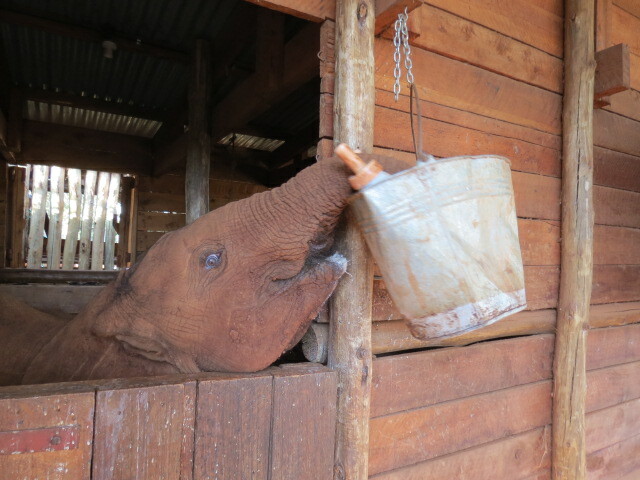 All grown up and bottle-feeding himself! 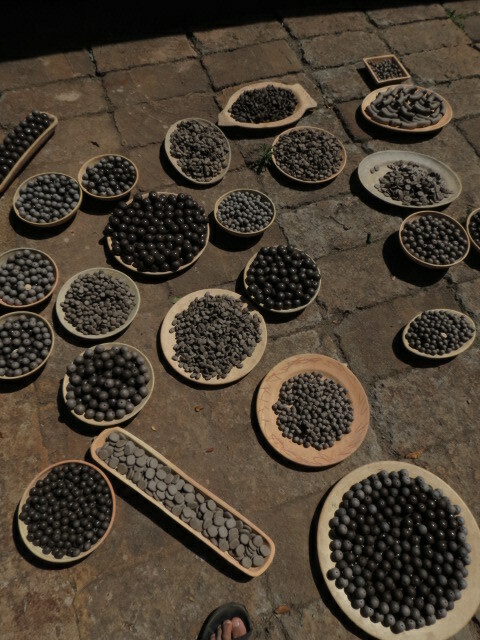 To pass the time before the private viewing, we made a stop at Kazuri Beads in the Karen & Langata neighborhood. (Kazuri in Swahili means “small and beautiful.”) What began as two women is now a workforce of 100+ single mothers and disabled women who commute daily from the slums to make a living for themselves. 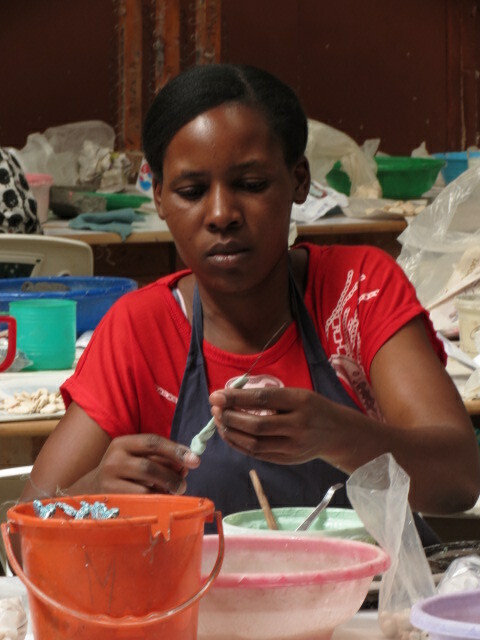 A tour of the facilities covered everything from clay making to molding to painting and glazing–it’s a well-oiled operation that provides opportunity and empowerment to a disadvantaged social group. 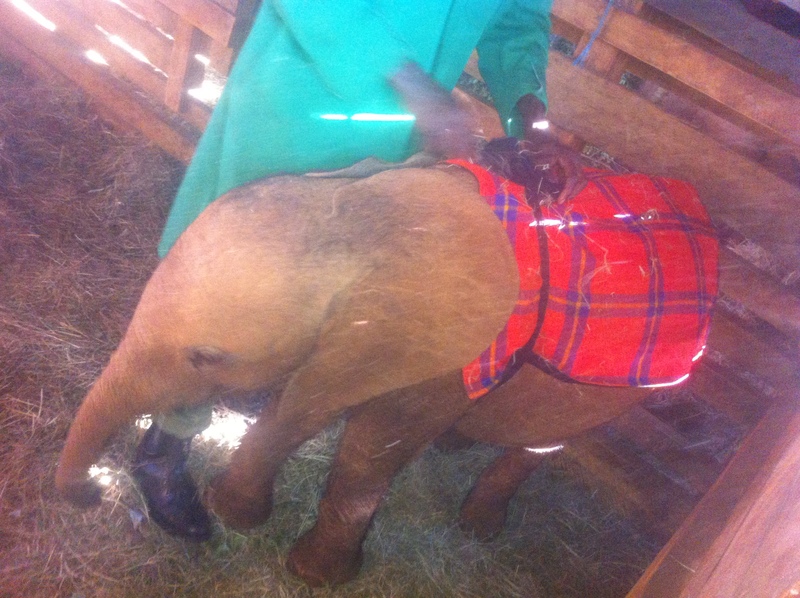 Back at the elephant center, we watched the keepers bring all 20+ babies from the bush. The young ones strutted (some ran) into their pens in anticipation of their milk nightcap. Walking around, we looked on as some babies were wrapped up in blankets, a few babies cried out for more milk, and one cheeky little guy chewed on his trainer’s coat (and then proceeded to chew on Eugene’s arm). Sonje, who will be released back into the wild soon, spent the entire time chowing down on dinner. Saying hello to the visitors! Last but not least, we can now add another home away from home to our ever expanding list: Jungle Junction. Popular amongst overlanders, the Nairobi house was packed the entire time. We met a few couples headed the same way, and after careful consideration, decided to change our route north to follow the caravan. 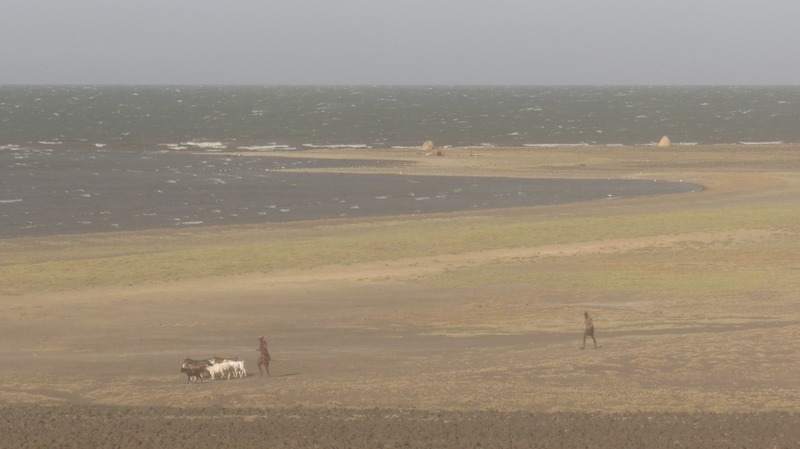 Instead of bumpy and bandit-infested Moyale, we are now headed towards remote and beautiful Lake Turkana, en route to Ethiopia. Heading North from Dar, the PPE made light work of the well travelled and nicely tarred Dar-Arusha road. 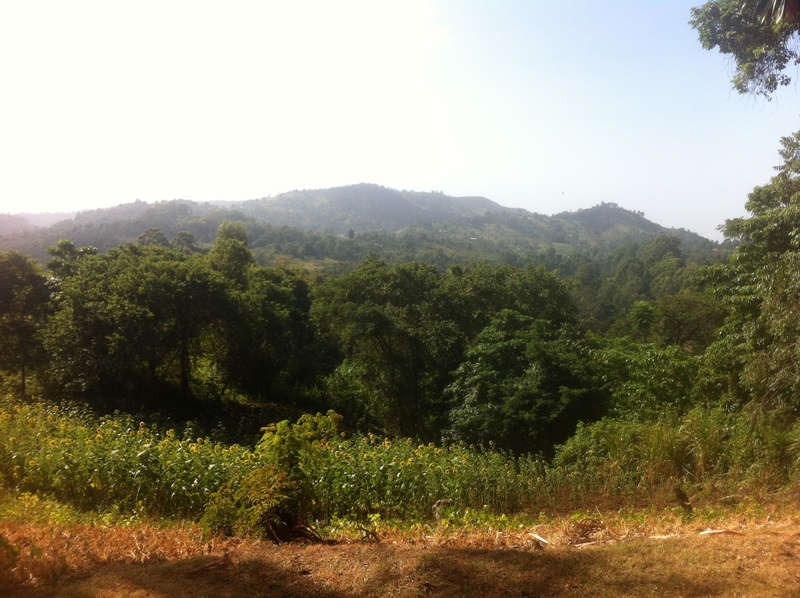 Although we had planned on staying further up the Swahili coast at Pangani, we settled on Lushoto, in the Usambara Mountains and were met with sparklingly cool mountain breezes. 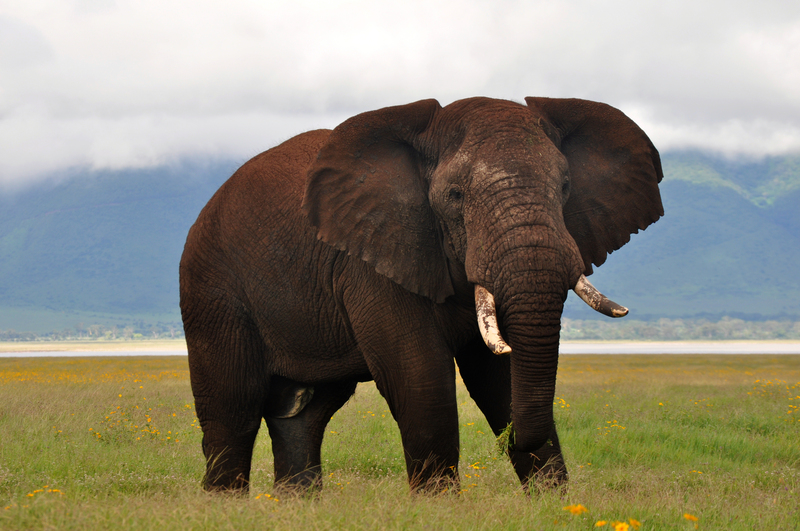 Not since Swakopmund, on Africa’s West coast had we experienced sub 25 degree temperatures… it was a spectacular change. 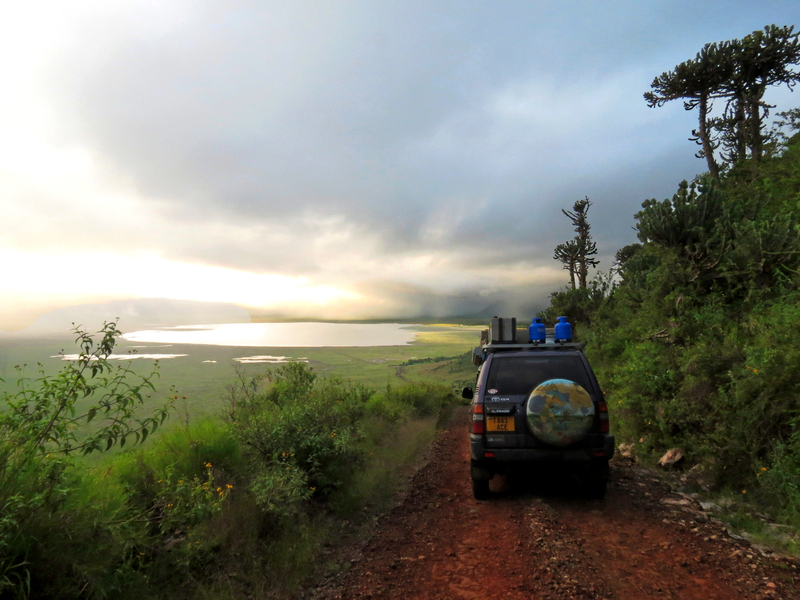 After a visit to the local children’s orphanage and some relaxing mountain walks, we got word of a great little camp site to the North-West at Lake Chala, straddling the Kenyan / Tanzanian border. 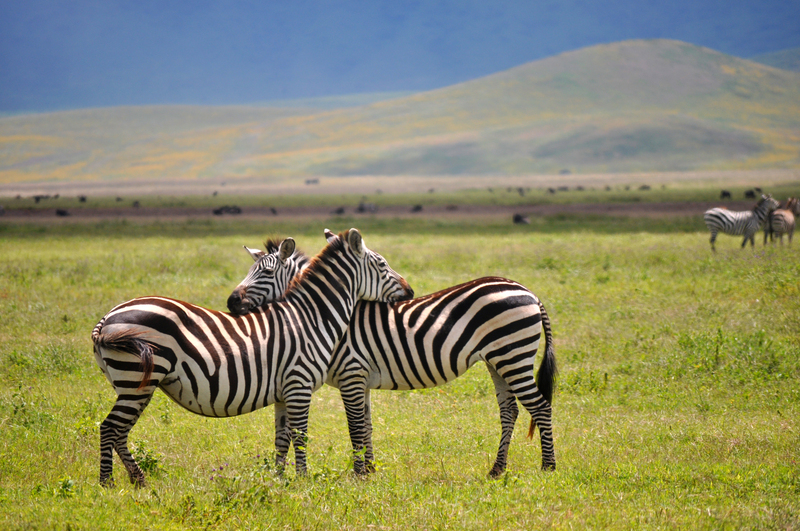 Keen to avoid the heavily trafficked border post outside Arusha, we beelined for the small camp. 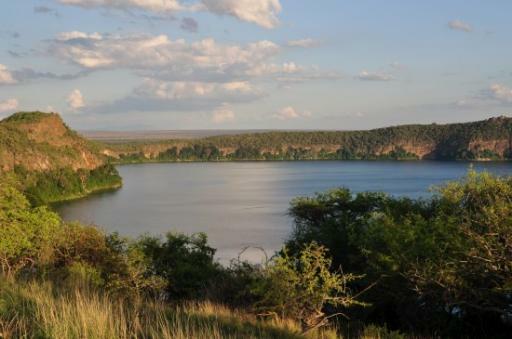 At Chala we were met with a magnificent crater-lake, whose azure waters contrasted stunningly with the dry African savannah surrounding it. Unfortunately, the return of the African heat and insatiable fly population forced our hand, and we pushed on the following day. 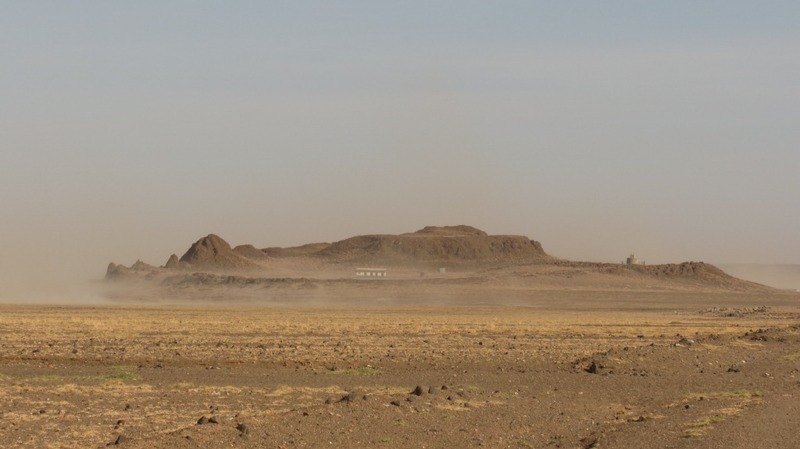 The border post at Holili was just a 5km drive from the turn off to Chala, but word on the street was that a luxuriously tarred road and new border post had recently opened that would cut driving time to Nairobi down to 5hrs. 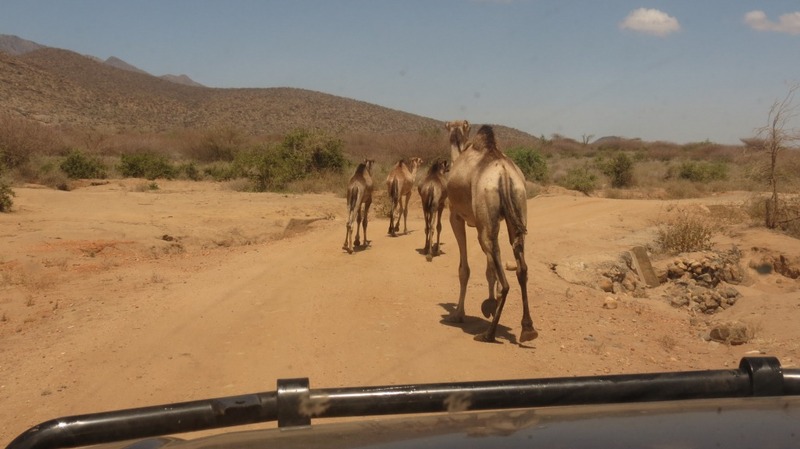 Juxtaposed against a notoriously rough road connecting Holili to the Nairobi-Mombasa highway, we opted for the more luxurious and direct affair, and quickly found ourselves at the small Tarakea border town. We breezed through immigration with the usual formalities. 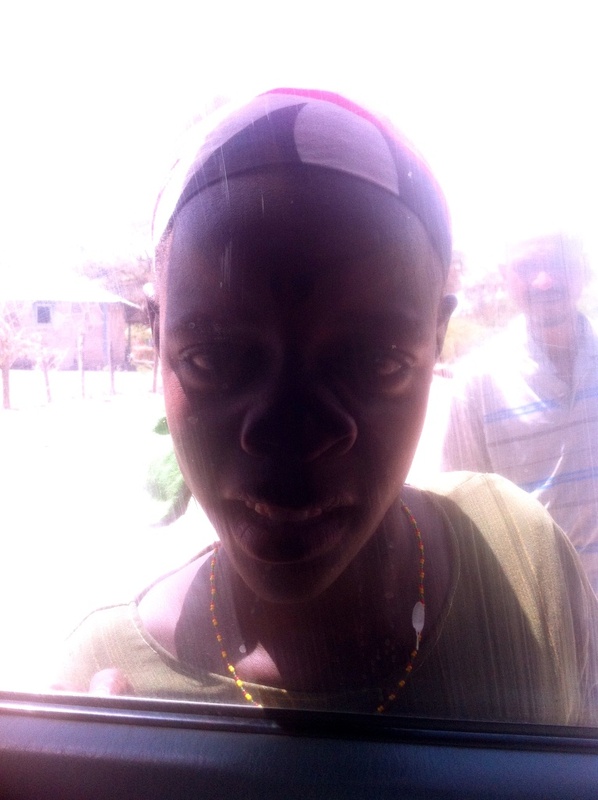 However, just as we were making our escape, we were accosted by a local customs official who appeared upset that we had neglected to visit his office on our way to the Kenyan border. He revealed that Tanzanian vehicles leaving the country were compelled to leave their original registration papers at the border, and demanded we comply. 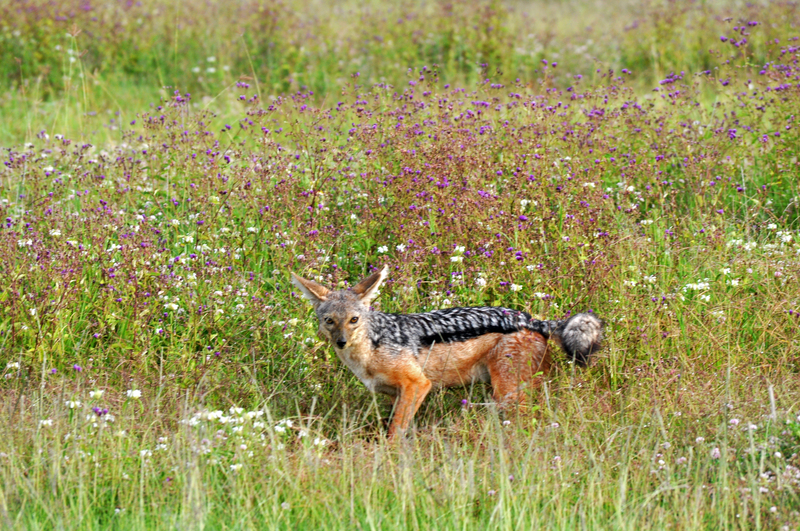 Having explained that we had travelled across Southern Africa without ever having to do so, I quickly objected, reasoning that retrieving our proof of ownership of the Purple People Eater at a remote border post 2 months later would be a bad idea. After heated exchanges and a lot of waiting (usually a good strategy when dealing with local bureaucrats), our good friend called the local police mama. Understanding completely our predicament of re-entering Tanzania via a different border, she showed some sympathy, yet concluded that ‘procedures must be followed’ with a shake of the head in a matter-of-fact way. Meanwhile, the good customs official sensed a possibility that the police mama may in fact be allowing us to pass, undermining his authority. Fearing the worst, he retreated to his office and returned, brandishing a glimmering, never before used, steel chain, and proceeded to secure it to the border gate. His determination that we would not pass was infallible. The gaggle of numerous locals who had turned up to pass judgement on the situation giggled at the customs ‘babu,’ infuriating him further. He resolutely pad-locked the gate. We would not be passing through Tarakea today. 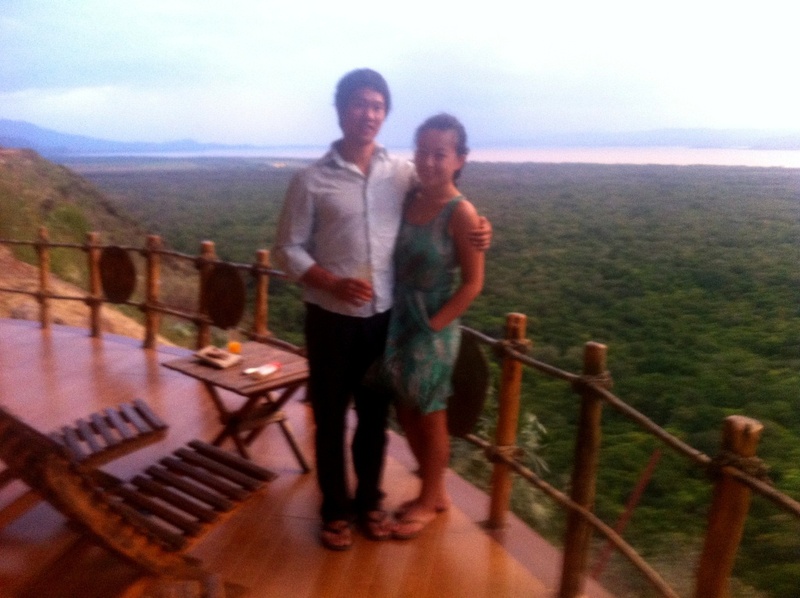 Left with no other option, Christine and I resolved to drive the 80km back to Lake Chala to try the Holili border post. Low and behold, we passed in a blink of an eye, and were subsequently met with over 100km of close to the worst driving conditions we have seen this trip. 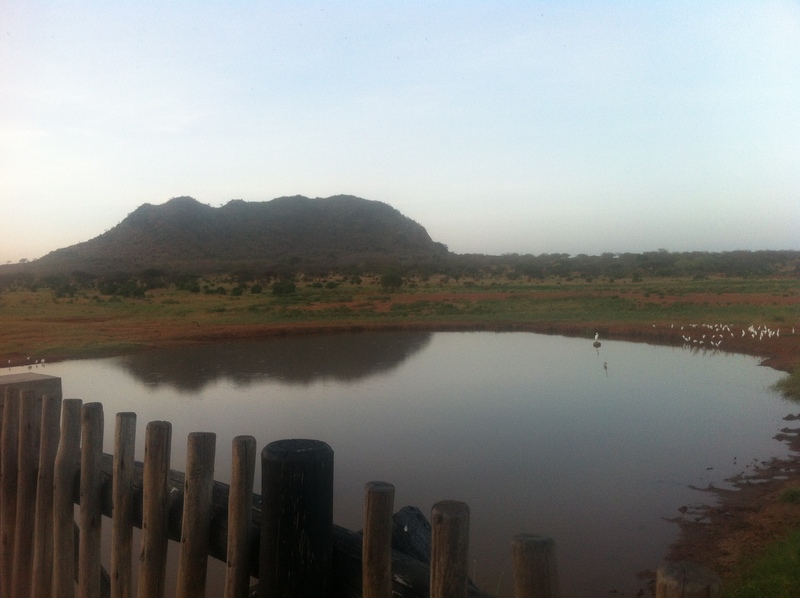 Arriving eventually at the town of Voi, we stayed at the luxurious Voi Wildlife Camp bordering East Tsavo national park. 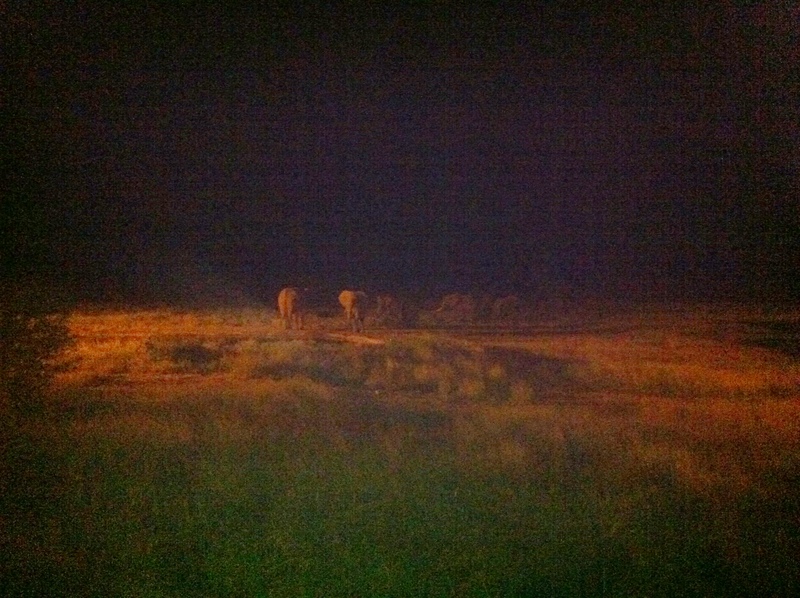 We were greeted instantly by the famed ‘red elephants’ (Tsavo elephants use the red mud to protect their skin from parasites) over some sundowners, albeit some distance away. They returned during our dinner, appearing out of nowhere just over Christine’s shoulder. 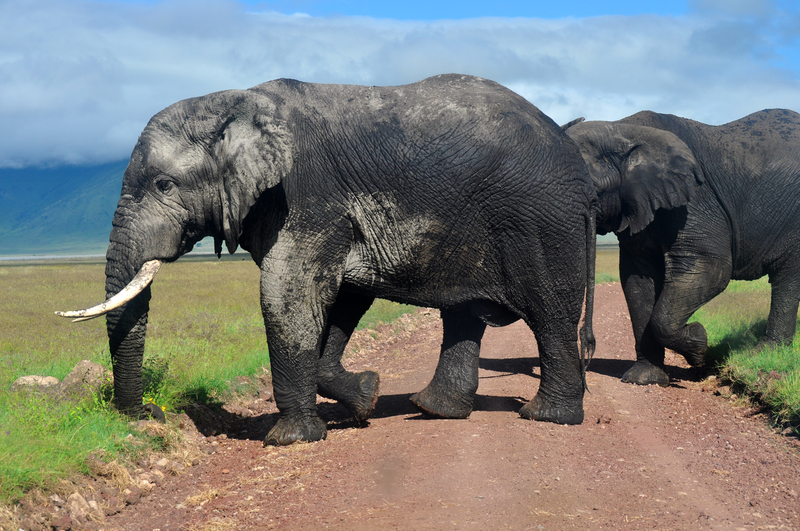 As we feasted on our buffet dinner, a herd of greedy elephants playfully quenched their thirsts at their local watering hole just metres away. A magnificent end to a rough, rough day! A month in Dar.. and counting..
We made a hurried return back to Dar just in time for Christmas.. and lo and behold.. we’re still here. What was meant to be a week in town catching up with friends turned into six. 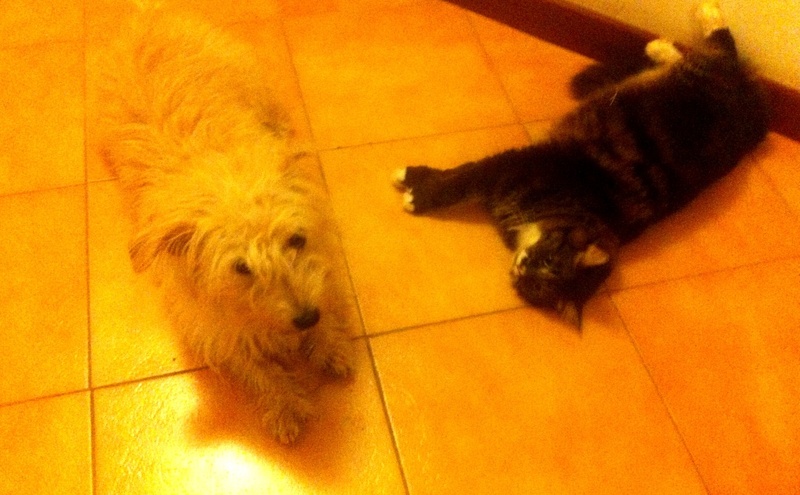 Nevertheless – Christine and I are planning our escape for the end of this week.. and who knows – we might even make it. Sim and Carrie were heading up to Turkey and Sudan for a few weeks and, well, wouldn’t we think about house sitting until their return? 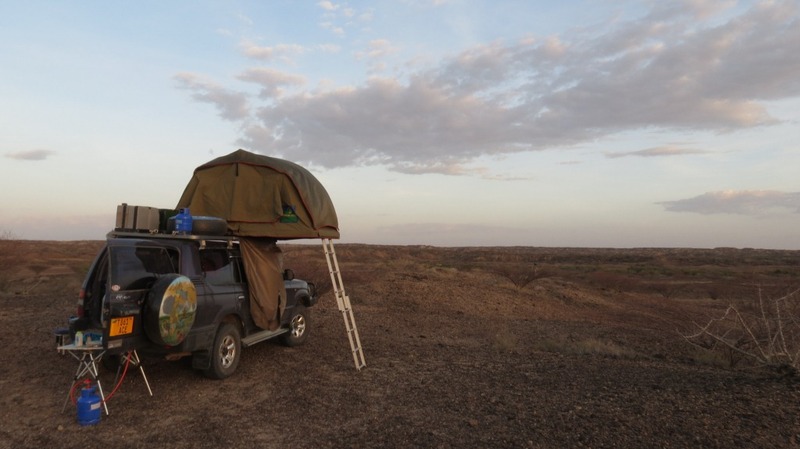 After 3 months in our roof tent, we revelled in the luxuries of a solid roof over our heads. 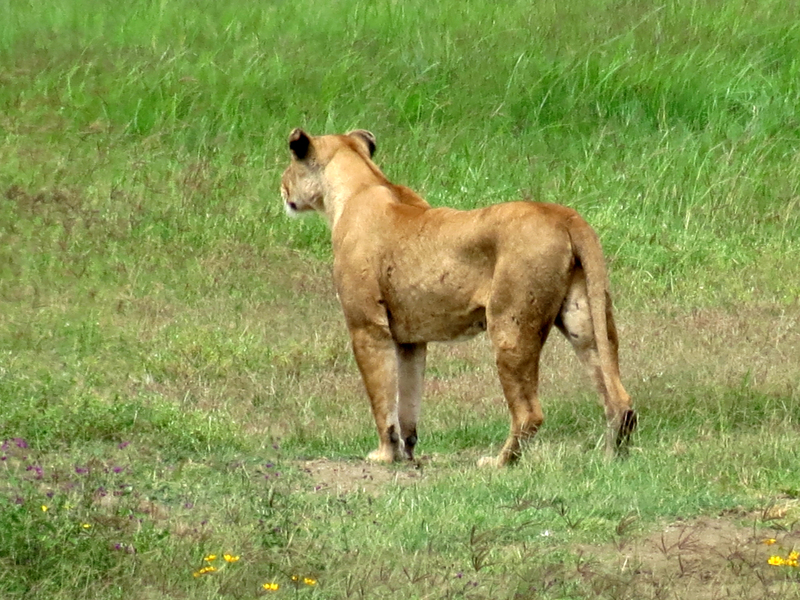 We knew it would be difficult leaving so soon, and with this little duo needing a bit of company, we hastily obliged. After weeks of camp cooking, our favourite restaurant in Dar did not disappoint. Yes, we’ve been back more than a few times. More so than any other place we’ve yet visited, Darwin Award moments are everyday occurrences in Dar es Salaam. 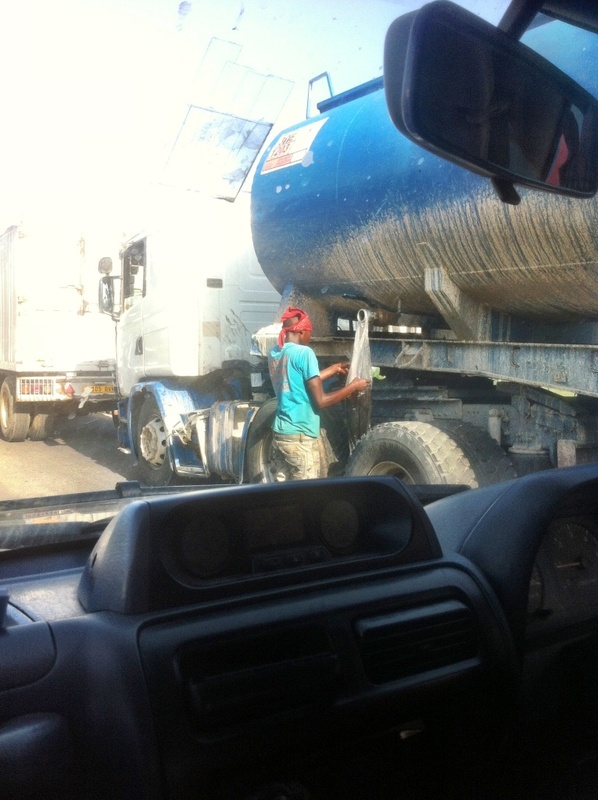 We were stuck in bumper-to-bumper traffic one afternoon, and there appeared a come-one-come-all petrol freebie from this Lake Oil Tanker, with double-bagged plastic bags the container of choice. 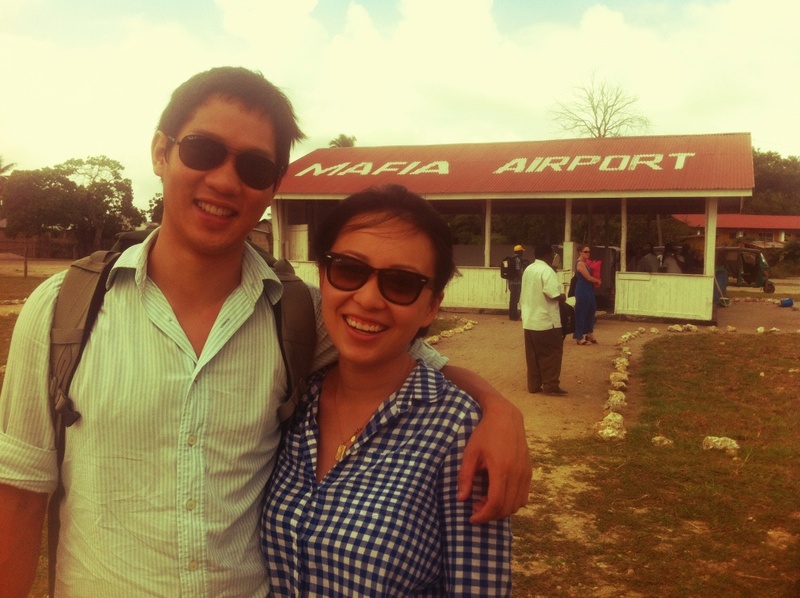 Our prolonged stay in Tanzania meant we were just in time for a team trip to Mafia Island. We flew in on a 13-seater Cessna with Leigh, Drew, Jacie, and Dan, to find both an open air terminal and the height of whale shark season awaiting us. Neither would disappoint. After countless trips scouring South East Asia and the East African coast for the majestic whale sharks, we finally, finally, enjoyed a dip with these incredible creatures. Shy at first, they would quickly dive into deeper water when confronted by the gaggle of arms and legs flailing in front of them. 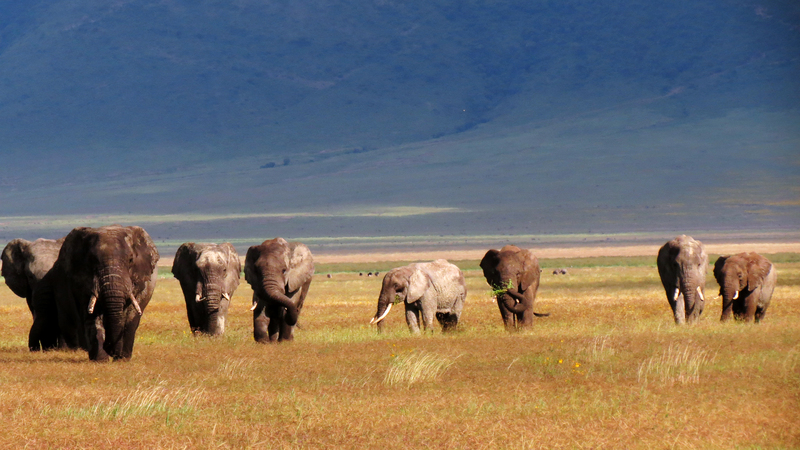 But soon enough, they became comfortable enough for us to approach. It was a special moment to swim side by side the 10m long giants, as they grazed on the abundant plankton. We were awestruck by their languid motion and the ecosystems of marine life travelling alongside. 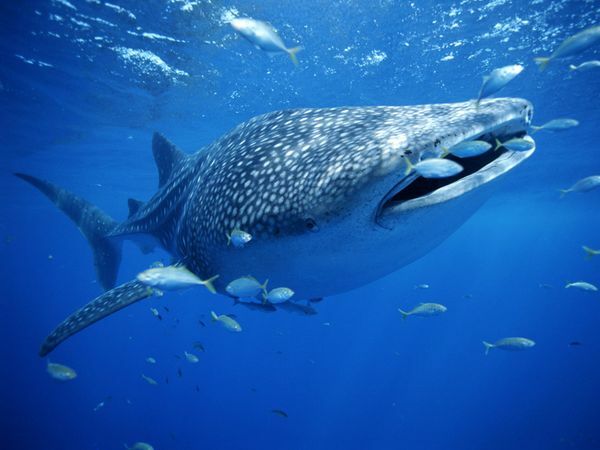 And just when it was time to leave, we found ourselves cornered, encircled by a group of 6 whale sharks as they fed. After this author was dunked unceremoniously underwater by a ‘loved one’ in her vain attempts to dodge oncoming sharks a few too many times, we escaped with our lives, wide eared grins all round.